Ikki Kita (北 一輝, Kita Ikki, 3 April 1883 – 19 August 1937) (real name: Kita Terujirō (北 輝次郎)) was a Japanese author, intellectual and political philosopher who was active in early-Shōwa period Japan. A harsh critic of the Emperor system and the Meiji Constitution, he asserted that the Japanese were not the emperor's people, rather the Emperor was the "people's emperor". He advocated a complete reconstruction of Japan through a form of statist, right-wing socialism. Kita was in contact with many people on the extreme right of Japanese politics, and wrote pamphlets and books expounding his ideas. The government saw Kita's ideas as disruptive and dangerous; in 1937 he was implicated, although not directly involved, in a failed coup attempt and executed. He is still widely read in academic circles in Japan. However, Kita was also interested in the radical right wing. The right-wing, ultra-nationalist Kokuryūkai (Amur River Association/Black Dragon Society), founded in 1901, was part of a current that has a history traceable back to the Genyosha (Deep Ocean Society/Genkai Straits Society) of 1881, founded by Tōyama Mitsuru. Tōyama, with many contacts in the Japanese establishment over a period of fully half a century, in turn claimed to be the rightful successor to Saigō Takamori, who pushed for Japanese expansion to the Asian mainland in the early Meiji era. Kita's article called "Tut-tut, those who oppose the war [with Russia]" showed he had little time for "those idiots" who opposed the Russo-Japanese war. In addition, Kita's first book, the Kokutairon book (the one purportedly on "pure socialism"), was banned upon publication. Some have argued from this to assert that Kita must have been deemed a radical threat from the left to the government. However, the case of Uchida Ryohei's anti-Russian book Roshiya bokoku ron (On Decaying Russia) was also subjected to a ban upon its appearance, five years prior to Kita's own suppression by the authoritarian Meiji state. The government had a predilection for banning books, irrespective of whether they stemmed from the right or from the left of the political spectrum. By the time Kita returned to Japan in January 1920, he had become very disillusioned with the Chinese Revolution, and the strategies offered by it for the changes he envisioned. 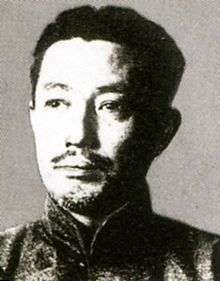 He joined Ōkawa Shūmei and others to form the Yuzonsha, an ultranationalist and Pan-Asianist organization, and devoted his time to writing and political activism. He gradually became the leading theorist and philosopher of the right-wing movement in pre-World War II Japan. Kita first outlined his philosophy of nationalistic socialism in his book The Theory of Japan's National Polity and Pure Socialism (国体論及び純正社会主義, Kokutairon oyobi Junsei Shakaishugi), published in 1906, where he criticized Marxism and the class conflict-oriented socialism as outdated. He instead emphasised on an exposition of the evolutionary theory in understanding the basic guidelines of the societies and the nations. In this book Kita explicitly promotes the platonic state authoritarianism emphasizing the close relationship between Confucianism and the "from above" concept of the national socialism stating that Mencius is the Plato of the East and that Plato's concept of organizing a society is far preferable to Marx's. Kita's second book is entitled An Informal History of the Chinese Revolution (支那革命外史Shina Kakumei Gaishi and is a critical analysis of the Chinese Revolution of 1911. His political views over the national and political future of Japan first appeared in various articles he penned from 1903 to 1906, while he was still based on Sado. It reappeared in his last major book on politics, An Outline Plan for the Reorganization of Japan (日本改造法案大綱, Nihon Kaizō Hōan Taikō), first published in 1919, and republished in 1923. The common theme to his first and last political works is the notion of a national policy (Kokutai), through which Japan would lead a united and free Asia (see pan-Asianism). According to his political program, a coup d'état would be necessary as to impose a more-or-less totalitarian regime based on a direct rule by a powerful leader. Due to the unconditional respect that the Emperor enjoyed in the Japanese society, he identified him as the ideal person to play that role, suspending the Constitution and radically reorganize the Diet to be free of any "malign influence". The new "National Reorganization Diet" would nationalize certain strategic industries, impose limits on individual wealth and private property, enact a land reform to benefit the farmers, as to strengthen Japan enable it to liberate Asia from Western imperialism. This was termed the Shōwa Restoration. In its historical prospect Kita's political program was for creating a state socialism in a rather fascistic oriented "socialism from above", as a tool to unite and strengthen the Japanese society in order to materialize the core element of his program, the unification of all Yellow peoples in a common empire, under common spiritual values. To this end, according to his view both agrarianism, social justice and militarism needed to be implemented as the only way to win the people's support as well as the reaction of the major Western Imperialistic Powers. In short, although he called for overseas expansion as, among other reasons, a way to relieve the increasing population pressures in the Japanese mainland, he saw this program as being in harmony with the other "Yellow" nations' interests, in a racist-oriented way of liberation and unification of the Asian people rather than in a nationalistic way of occupation in a Western-like colonial fashion. However, Walter Skya notes that in On the Kokutai and Pure Socialism, Kita rejected the Shintoist view of far-right nationalists such as Hozumi Yatsuka that Japan was an ethnically homogeneous "family state" descended through the Imperial line from the goddess Amaterasu Omikami, emphasizing the presence of non-Japanese in Japan since ancient times. He argued that along with the incorporation of Chinese, Koreans, and Russians as Japanese citizens during the Meiji period, any person should be able to naturalize as a citizen of the empire irrespective of race, with the same rights and obligations as ethnic Japanese. According to Ikki, the Japanese empire couldn't otherwise expand into areas populated by non-Japanese people without having to "exempt them from their obligations or ... expel them from the empire." This eclectic blend of racism, socialism and spiritual principles[nb 2] is one of the reasons why Kita's ideas have been difficult to understand in the specific historical circumstances of Japan between the two world wars. Some have argued that this is also one of the reasons why it is hard for the historians to agree on Kita’s political stance, though Nik Howard takes the view that Kita's ideas were actually highly consistent ideologically throughout his career, with relatively small shifts in response to the changing reality he faced at any given time. Kita's Outline Plan, his last book, exerted a major influence on a part of the Japanese military—especially in the Imperial Japanese Army factions who participated in the failed coup of 1936. After the coup attempt, Kita was arrested by the Kempeitai for complicity, tried by a closed military court, and executed. Kita (portrayed by Hiroshi Midorigawa) figures in the plot of Seijun Suzuki's 1966 film Fighting Elegy. 1 2 Koschmann, J. Victor (1978). Authority and the Individual in Japan. University of Tokyo Press. ↑ Large, Stephen S. (1981). Organized Workers and Socialist Politics in Interwar Japan. Cambridge: Cambridge University Press. ISBN 978-0-521-23675-1. OCLC 185302691. ↑ Crump, John (1983). The Origins of Socialist Thought in Japan. New York: St. Martin's Press. ISBN 978-0-312-58872-4. OCLC 9066549. ↑ Wilson, George Macklin (1969). Radical Nationalist in Japan: Kita Ikki, 1883–1937. Harvard East Asian Series. 37. Cambridge, Mass. : Harvard University Press. OCLC 11889. ↑ Howard, Nik (Summer 2004). "Was Kita Ikki a Socialist?". The London Socialist Historians Group Newsletter (21). London: London Socialist Historians Group. Archived from the original on 2008-04-24. Retrieved 2010-11-19. Saaler, Sven; Szpilman, Christopher W.A. (2011). Pan-Asianism: A Documentary History. Lanham, MA: Rowman & Littlefield. ISBN 978-1-4422-0596-3. Tankha, Brij (2006). Kita Ikki And the Making of Modern Japan: A vision of empire. Folkestone, Kent: Global Oriental. ISBN 978-1-901903-99-7. OCLC 255304652. Kamal, Niraj (2003). Arise, Asia! Respond to white peril. Delhi: Wordsmiths. ISBN 978-81-87412-08-3. OCLC 51586701.